The Dartmouth community cannot continue to abdicate its values. 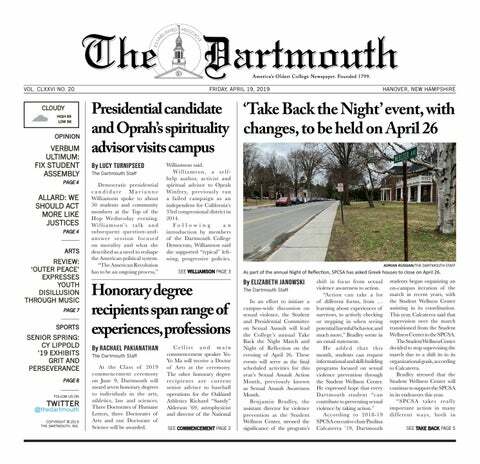 Tonight, the streets of Dartmouth’s campus will be uncharacteristically quiet. The throngs of students that normally populate Webster Avenue and Wheelock Street will be absent. Instead, various social spaces will hold public and private conversations on their complicity in and perpetuation of a perennial outrage at the College as well as universities across the country: sexual violence and assault. This reckoning is long overdue and all too necessary. Pledges to curtail and prevent sexual violence must not be confined to the month of April. To have any chance of success, Dartmouth must be sincere and relentless in the reformation of its social spaces. As the Dartmouth community acknowledges its historical perpetuation of toxic social spaces, it is worth remembering why these spaces exist in the first place. Such introspection is necessary for designing and working toward a safer, healthier social environment for all: one free of violence and abuse, one in which no one is endangered while searching for community. That closing social spaces serves as a statement at all is evidence of the high value that the Dartmouth community places on them. It also reveals why such spaces are created and endure, and why students are so insistent on reforming systems rife with entrenched challenges: many community members seriously value and enjoy the fellowship and entertainment that social spaces bring. Dartmouth, like most college campuses, is a hotbed of social activity. Unlike most universities, however, the majority of Dartmouth’s social life is institutionalized. Organizations such as the Greek system and the housing system, as well as various programming clubs and teams are responsible for facilitating the vast majority of interactions on a disproportionately small, social campus. Each of these organizations embrace the broader values that Dartmouth promotes. Fellowship, realizing a shared identity and the upholding of tradition are cornerstones of life at Dartmouth. Students and student groups regularly aspire to and exemplify these ideals well. When it comes to issues of sexual violence and assault, however, the community has a disappointing track record of adhering to the ideals it ostensibly advances. When the community fails to properly center victims of assault and sexual violence, students marginalize their most vulnerable in times of need. When community members fail to hold perpetrators of sexual violence accountable, they poison the spaces they hold dear with moral and legal transgressions unbecoming of the College, or any upstanding collective. Dartmouth must do better, principally for the sake of its survivors, but also for the integrity of its social and moral fabric. Acknowledging this history is an important first step in redressing old shortcomings. The present reality of the situation must also be understood if strategies for successfully combatting sexual violence and assault at the College are to be achieved. According to the College’s 2017 Sexual Misconduct Survey, 34.1 percent of women, 26.3 percent of transgender and gender non-confirming individuals and 6.9 percent of men among the undergraduate population have been sexually assaulted in a manner involving physical force or incapacitation. The same study also found that 32 percent of all respondents who have experienced sexual assault met their perpetrator at a party. These statistics represent current Dartmouth students and are indicative of the present crisis campus is experiencing. It is in the interest of every social space on campus to curb incidents of sexual assault and assist in constructing a campus culture that does not tolerate violence in any form. It is encouraging that the campus response to the call to action issued this past Sunday has been positive. Greek organizations, senior societies and College-affiliated programs have issued statements of support for the stance. That said, campus organizations must not be timid in their affirmations, lest they risk cheapening their statements to mere platitudes. It is also important to explicitly state the burden of action on social spaces at the College. Greek organizations, as the dominant facilitators of social life at Dartmouth, hold an outsized responsibility in combatting sexual violence at the College. Organizations should be uncompromising with their membership on this topic, holding their members to high standards for training and education regarding sexual violence, and removing members who commit or facilitate such acts immediately. In the past, Greek organizations have been both commended and criticized while working with the Office of Greek Life and participating in initiatives within the College to find solutions to these issues. Going forward, there is room for improvement in streamlining disciplinary processes and programs. More broadly, Dartmouth organizations must be innovative in reshaping how students at the College socialize. Studies show that the presence or involvement of alcohol increases the risk of sexual assault or violence occurring. This finding was included as a reason for the banning of hard alcohol as part of the Moving Dartmouth Forward Initiative. Decentering the role of alcohol in Dartmouth related relaxation and recreation may be integral to curbing sexual assault and violence at Dartmouth. Eventually, the mild inconvenience felt by some on the Night of Solidarity will fade. Dartmouth students will again revel and enjoy the social spaces they hold dear. Whether the same energy, observance and compassion exhibited on Friday will continue into the future remains an open question. If Dartmouth is to hold fast to its values, if its social spaces are to become the best, most inclusive and upstanding versions possible, sexual violence and assault must be wiped from the community. Dartmouth is better than this, and is also capable of overcoming its challenges. Nothing less than the community’s collective honor and values are at stake should it fail.